While I’m thinking about spaces of confusion and installations that can disorientate the viewer it seems like aa good opportunity to have think about Martin Creed’s Work No. 200 and Work No. 247 both also titled Half the air in any given space. 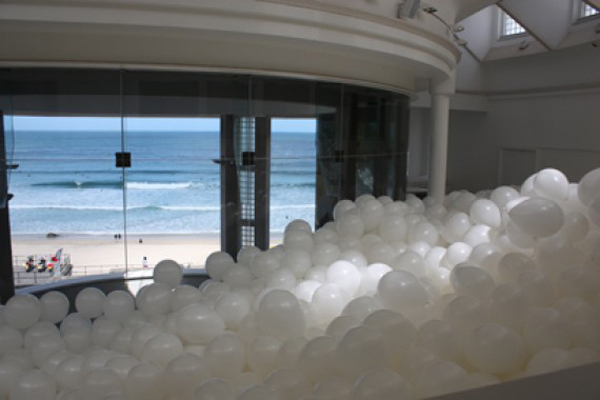 In these works, half the air in the space is separated from the rest by being contained within balloons. This is another work I’ve somehow managed to miss and it’s right there on my list of things I really want to see. In part, I want to see this because I usually really like Creed’s work. But, in all honesty, it’s also because it looks like fun. A room (half) full of balloons. What’s not to like? Given that I am easily seduced by visual simplicity, I’d rather see Work No. 200 because the balloons are white; nonetheless I do rather like the weirdness of the sea of blue balloons. 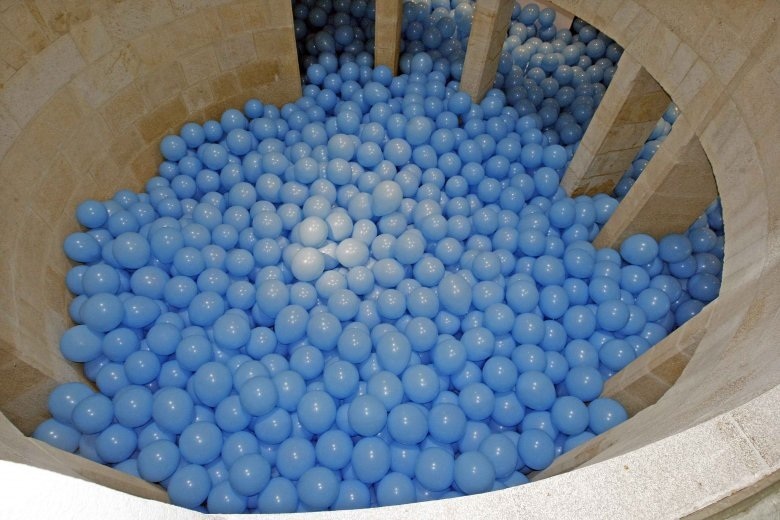 One of the things that intrigues me about this installation is the degree to which the playfulness of the room full of balloons is outweighed by the confusion and possible claustrophobia engendered by being lost in the space and uncertain of where others might be and how to reach the exits. One of the things I often like the most about Creed’s work is his willingness to leave space unfilled, and though this demonstrably isn’t the case here there is still a certain minimal aspect to the installation. Of all Creed’s work though, the most empty and also probably the best known – or more accurately, most notorious – is Work No. 227: The lights going on and off which was shown at Tate Britain when Creed won the Turner Prize in 2001. This work – an empty room in which the lights went on and off at five second intervals. I was really surprised by how much I enjoyedWork No. 227. Partly this was down to amusement at watching people trying to read the information panel in five second chunks but it was also simply about being in the space and being able to enjoy the emptiness. Mike Nelson – one of my favourite artists – was nominated the same year and after the elegance of Creed’s empty room, his work felt cluttered; I was overwhelmed by stuff and by the need to disentangle the narratives suggested by the installation. I’ve since concluded that the artist who shows the emptiest space has a head start in winning me over. This seems to particularly apply to Turner Prize shows. 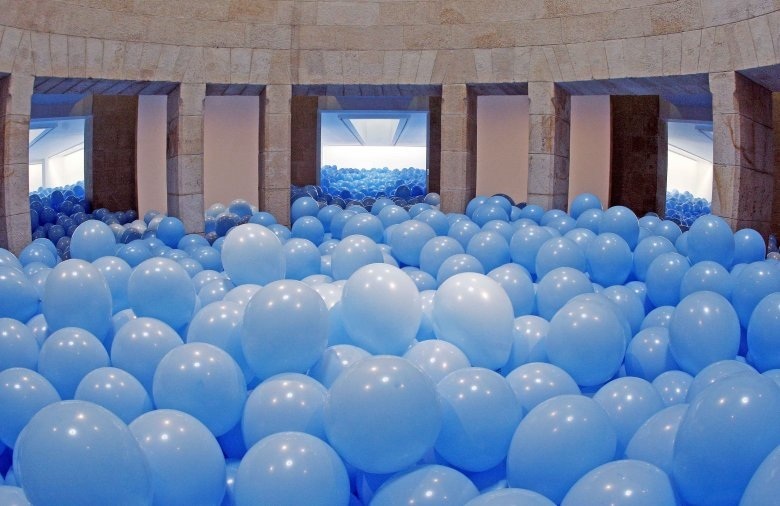 This entry was posted in Installation and tagged art, balloons, Half the air in any given space, installation, Martin Creed, The lights going on and off, Work No. 200, Work No. 227, Work No. 247 by Ann Jones. Bookmark the permalink. I love this. I’d not heard of Creed, but love all the installations you’ve posted and will now do a search on him. Thank you for the post: text & images.Creed’s work is so compelling.